Dimensions 0.25 by 6 by 9.75 in. Amazon.com description: Product Description: Immortal Sisters presents life stories and teachings of distinguished female Taoist adepts who lived from the third to twelfth centuries. Among them is the poet and mystic Sun Bu-er, who passed into folklore as one of the famous Seven Immortals and appears as a character in countless popular novels of China. These accomplished women, renowned in their own day and in history, represent a uniquely female heritage of spiritual mastery. 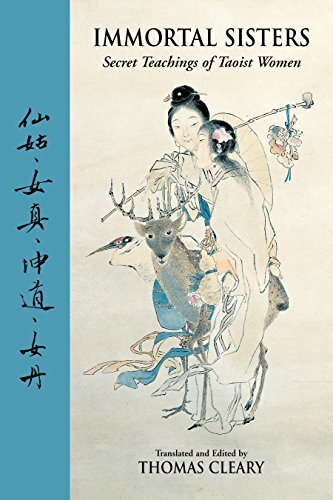 Through poems, stories, teachings, and commentaries, Immortal Sisters sheds light on the spiritual methods taught and practiced by these women and illustrates the importance of the feminine in Taoism. About: Immortal Sisters presents life stories and teachings of distinguished female Taoist adepts who lived from the third to twelfth centuries.